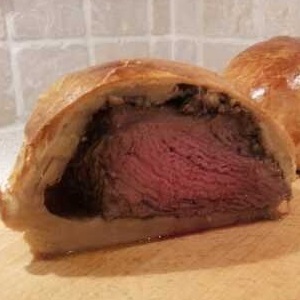 This is a delicious and easy recipe for Beef Wellington. Although beef wellington is easy to prepare it is a bit involved requiring chilling through the preparation stages. It is an ideal meal to prepare earlier in the day before your guests arrive! Heat 2 tbsp of olive oil and 2 oz butter in a large pan and sauté the mushrooms on a medium heat, with 1 large sprig fresh thyme, for about 10 minutes stirring often, until you have a softened mixture. Add 3 ½ oz of dry white wine to the mushrooms and sauté about 10 minutes until all the wine has been absorbed. The mixture should hold its shape when stirred. Remove the mushroom mixture from the pan to cool and discard the thyme. Overlap two pieces of clear cellophane over a large chopping board. Spread half the mushroom mixture onto the cellophane then sit the beef fillet on it and spread the remaining over the beef. Chill for at least 30 minutes (up to 24 hrs).